Burned-out media hotshot Joe Palmer goes to Barcelona in search of – well he doesn’t want to be greedy but a total life makeover would be nice. A new career, a love life, solvency, self esteem – he didn’t think it was too much to ask. And while there he decides to search for his biological father, aka Domingo the Waiter, who did a runner shortly after a less-than-immaculate conception on an Estartit beach in the Sixties. It should be easy enough, thinks Joe. After all, it was only a lifetime ago and how many waiters called Domingo can there be in Spain? Fortunately help is at hand in the form of the fragrant and flamboyant Quentin La Bouche, a larger than life Queen of the Costas who’s had more than a little experience at finding waiters himself. 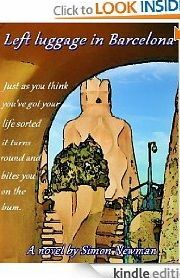 But Joe’s path takes a different turn when a man claiming to be Antoni Gaudi, the enigmatic architect of the Sagrada Familia, comes back from the grave and entangles himself in Joe’s new life. He’s forced to confront the Gaudi Enigmas, seven mystical poems written each day of the week leading to the architect’s death. Did Gaudi himself really write them and what can they mean? Joe’s not exactly a deep thinker, but this turn of events has him re-evaluating things he always considered important in his life – aside from his boxed set of Morrissey albums, obviously. He gets into a number of scrapes too, including a blast from the past where he finds himself inexplicably back on the streets of 1920’s Barcelona just as Gaudi is fading away. His love life is no less complicated. Joe knows that getting invovled with his boss Kristen (though undoubtedly having its gratifying moments) is bound to end in tears and a P45. And if he does, where will that leave him with Liz, the statuesque Gaudi expert who’s taken Joe under her wing? In his innocence he really believes he has a choice between the two of them. It’s not as simple as that Joe. It is? Oh, right. Ultimately his search for just about everything leads to self redemption of a kind, but mainly to the discovery of an eternal truth. Just as you think you’ve got life sorted, it turns round and bites you on the bum. Joe Palmer is a forty-something who’s had his day, but wants it back again. Blagging is the only thing he’s good at if truth be told, which isn’t very often. Posing as his alter ego Joaquim de Palma he clinches a job in Barcelona by learning a short passage in Catalan – though sadly this recipe for boar-testicle stew ultimately proves to have limited application in the business world. Quentin La Bouche the camp-as-Christmas owner of a down at heel bar in Estartit improbably called the “Viva Espana.” He sports a gruesome ginger Brillo-pad toupée and perilously tight leather trousers. But Quentin’s a deep soul, and turns out to be the clichéd-but-true tart with a heart. Just don’t get him singing Candi Staton’s “Young hearts, run free.” Okay? Just don’t. Manolo is an overweight, avuncular security guard at the Sagrada Familia who befriends Joe. His current lowly status in life belies his illustrious past and the connections he still holds in high places, especially in Barcelona’s judiciary. All rise for Manolo. Aksell the barman at the Viva Espana. A classically beautiful Nordic medical student who’s on his gap year (or three) and seems to have done it all and got the sleeveless tee shirt. Can he really be that perfect? Joe puts him to the test and finds, to his great relief, that Aksell has no sense of humour – and even less sense of direction. Liz the supremely smart and cool professor of Catalan studies who tries to help Joe unravel the Gaudi Enigmas. She’s drawn to him but as a single parent she knows that managing sons and lovers, not to mention a flaky ex and a high profile academic career, can take some juggling. Fortunately she can juggle pretty well, but is Joe really worth the effort? You can sample the first chapter of Left Luggage in Barcelona by Simon Newman on Amazon Kindle for free, then buy the book if you wish. Available in English language on both the UK and French Amazon sites. If you don’t have a Kindle, you can still download the book to a PC, laptop or tablet, using a free Amazon/Kindle app that’s quick and easy to install.